ALPHA OMEGA Management is extremely happy to announce transformation into a real worldwide network, probably the first-ever one, composed by hundreds and hundreds of collaborators throughout the world, coordinated by our management team. We call it “Management Network”! The main goal is to bring together the interests of all the professional figures related to worldwide music business; from labels to bands, from promoters to agencies, and all the other figures that collaborate around the music business, like Photographers, Artists, Merchandiser, etc! Entering to this new reality are our friends in METALHEADS FOREVER, a real army of potential management team members, providers of services, users of services, literally from all over the world (having today more than 123000 members), led by David Maloney ! The new “Management Network” is an organized network which is able to help everyone’s demands to work better and find the solutions under the same structure, which is not tied between 4 walls, but spread all over the world by hundreds of people under different roles! What for and whom the worldwide management is useful? – for BANDS because it will be much easier to find reviews, interviews, clubs, promoters, labels, merchandise, artwork and an unparalleled promotion at world level. – for LABELS because it will be much simpler not only to come in contact with new talents, but also to make sure that new talents have enormous potential to grow. – for CLUBS and LOCAL PROMOTERS because, it will be much easier to collaborate with new agencies and up-and-coming bands who are ready to invest in support slots, bringing an impressively bigger exposure for their events, through our network. – for everyone who provides services for bands (merchandiser, photographers, video-makers, artwork artists etc) because they will be able to reach the largest number of potential customers. – for all promotional agencies because, through our network, will be very easy to provide the services which are required by their customers (find a label, find concerts, find bands, etc). 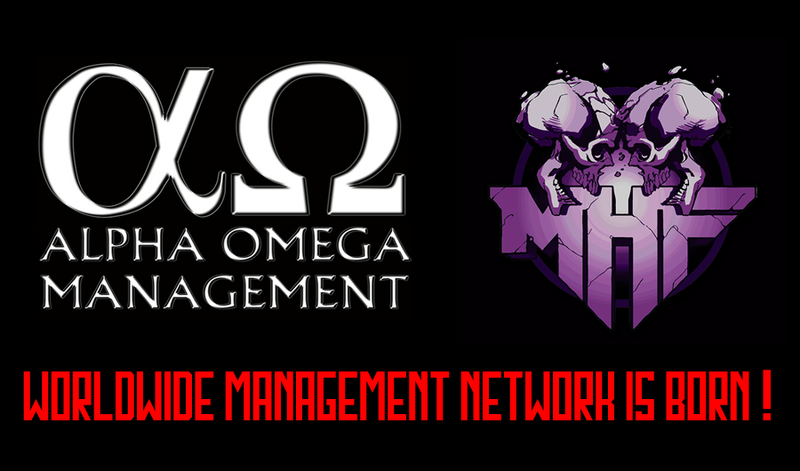 Within the past year we came in contact with some great friends at Alpha Omega Management. Over the past several months we have discussed the possibility of coming together and forming some form of partnership. Alpha Omega are already dominating a new way of thinking in terms of band Management and touring and recording. Both Entities feel working together can bring both a unique direction and fresh approach to ensure the best quality of services to each bands individual needs and much much more. Moving upward, onward and forward to provide the best opportunities possible.